Located in a secluded part of the Schanskraal Private Estate, the Country Manor is a magnificent Cape Dutch manor house surrounded by beautiful landscaped gardens and next to natural ponds which fade into the vast Karoo landscape. Generously proportioned throughout and offering executive luxury and comfort, the Country Manor is richly decorated in imported fabrics and stylishly furnished throughout with Cape Dutch furniture. There are 7 spacious individually decorated bedrooms, each with its own bathroom. 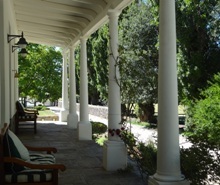 Within the Country Manor there is also an extensive library filled with tales of the Karoo, South African and European history, a sitting room and separate dining room all with fireplaces and a well-equipped and generously laid out kitchen plus a private wine cellar. Outside there is extensive terracing and a large front verandah, together with a patio area set against an attractive landscaped rocky hillside with natural rock garden and generous braii area. In the rocky hillside are stone seats and an elevated area where sundowners can be enjoyed whilst taking in the views, beyond which lies a beautifully landscaped heated swimming pool with thatched shaded areas, pool house and shower facilities. There is also a snooker room with full size snooker table and a bar. 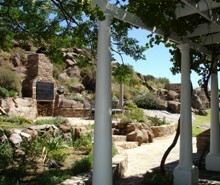 Schanskraal Country Manor also has a fully IT-equipped and air-conditioned Conference Centre. Close to the swimming pool area and coupled to the Manor’s accommodation, the Conference Centre is ideally suited for business and recreational seminars, executive breakaways, team building exercises, workshops, “bosberade” and product launches. With all the outdoor activities offered at Schanskraal, there is much here to contribute to a relaxed atmosphere, to facilitate successful brainstorming and teambuilding sessions. Charter flights can also be arranged from all major business centres to our private cross airstrip which is suitable for most light aircraft.